According to tradition, the original Tikhvin icon was painted by the Evangelist Luke and sent by him to Antioch. From Antioch, the icon was sent to Jerusalem, and later, in the 5th century, to Constantinople where a temple was built especially for the icon in the Blachere district. Although the icon disappeared from Constantinople several times, the last time it left the ancient city was in 1383. The icon first appeared in the Novgorod region of Russia during the reign of Prince Dimitry Ivanovich Donskoy. The first people to record its miraculous appearance were fishermen on Lake Lodoga, who reported seeing a bright light above them. The icon then came to rest about 25 miles from the lake at Smolnovo. The residents there built a chapel and many were cured of ailments. The icon is said to have mysteriously moved about from place to place and in each place, the people erected chapels and soon temples. The icon finally came to rest at Tikhvin, on the Tikhvin River in 1510. A wooden temple was built, dedicated to the feast of the Dormition, and the many who came to venerate the icon were cured of their ailments. The icon is especially revered for helping cure children’s illnesses and protecting families. Several times the wooden temple that housed the miraculous image was leveled by fire, but the icon remained unharmed. Through the efforts of Prince Basil Ivanovich (1503-1533), a stone church was built to replace the wooden temple, which had burned down. During construction, a section of arches crumbled, burying 20 workmen. Although all considered them dead, after three days the 20 men were found alive. About 50 years later, a monastery was established at the church. The Tikhvin Monastery was believed saved from destruction by the intercession of the Tikhvin Mother of God in 1613 when the Swedish forces invaded the country and besieged the cloister. 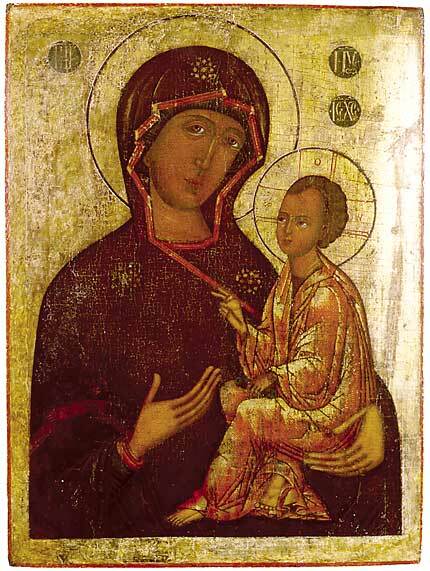 The size of this icon suggests that it was most likely a church icon placed in the local tier of the iconostasis. It is quite probable that the church or chapel which once held this icon was named Tikhvin. The style and color conform in almost every way to the “old” style of icon painting. It is a fine example of an icon which displays a small but all-important feature revealing one of the first elements of Western influence to be detected in traditional icon painting of the period. In this icon the eyes of Mary display an anatomically correct feature which would have never been included in an icon painted only a few decades earlier: tear ducts.